I spent a huge chunk of the day sewing and I was exhausted by late afternoon, so I wanted something easy for dinner tonight. This salmon dish is gluten and dairy-free and after doing some research on clean eating, it qualifies under that category too! I cooked a batch of brown rice, broiled some salmon, steamed some broccoli, cut some lettuce from the garden for a simple salad, and made a homemade honey mustard dressing to drizzle over everything. 1.When rice has been cooking for about 20 minutes, Turn oven onto broil. Season salmon filets with salt and pepper and broil for 10 minutes. 3. To make honey mustard dressing, add 1 tsp of each type of mustard for each 1/4 cup of honey and whisk to combine. 4. 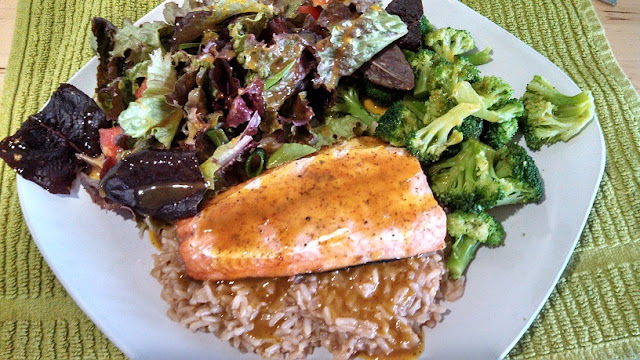 Then simply place salmon and broccoli over the rice and drizzle with dressing. Note: If you don't generally make brown rice, it's not difficult. Simply use 1 part rice to 2 parts water (so 2 cups rice will get 4 cups water). You can also use broth to give rice more flavor. Bring just to a boil, then reduce heat to low, cover and cook for 45 minutes until water is absorbed. If you like, you can add extra water and drain after 45 minutes.